In the winter of 1865, the bleakest of his life, George Lowry stood on the steps of the Robeson County courthouse. He had just emerged from an inquest into the murders of his two sons. He was 67 years old, born following an American Revolution. The county coroner had identified the Confederate soldier responsible for his sons’ deaths at the inquest, but the killer remained at large. The sheriff refused to arrest him. In his story of his people’s origins, Lowry emphasized the Lumbees’ freedom, their hospitality and reciprocity with English newcomers, and the journey from their original homeland, Roanoke, where these virtues were nourished. Lowry sought to strike a blow against death by pointing out the betrayal of at least one of these virtues, friendship with whites. George Lowry’s view may not be the only version of Lumbee origins, but it nevertheless gives us a legitimate starting place from which to piece the documentary record together. That process begins with an understanding that the Lumbees’ homeland is larger than Robeson County. 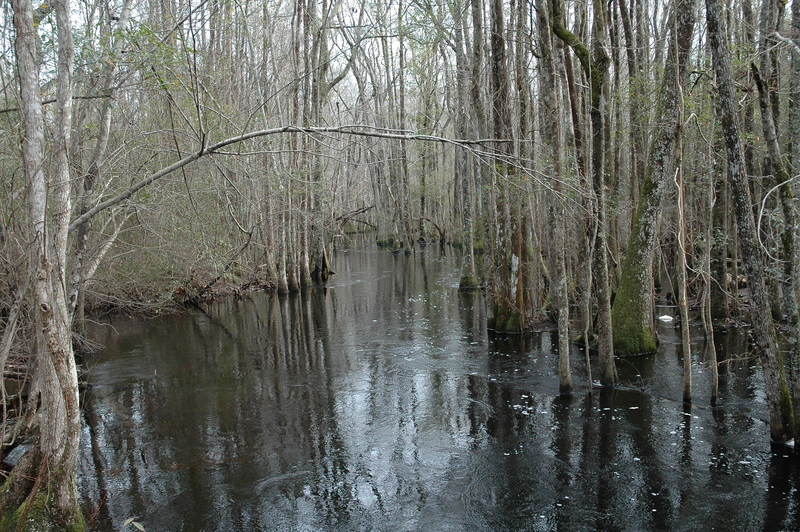 Many of the Lumbees’ ancestors came from places as far north as the James River in Virginia, south as the Santee River in South Carolina, east as the Atlantic Ocean, and west as the Great Pee Dee and Catawba rivers. That territory may not belong to them today, but it produced them nonetheless. “Roanoke” is neither the beginning nor the end of this tale of journeys, a tale that belongs to Indians in the southern United States in particular and to Americans generally. Many of the Lumbees’ ancestors came from places as far north as the James River in Virginia, south as the Santee River in South Carolina, east as the Atlantic Ocean, and west as the Great Pee Dee and Catawba rivers. Maps courtesy of UNC Press. In the 1580s, when Sir Walter Raleigh’s soldiers and settlers ventured into North America, they landed at the place the Algonquian speakers called Roanoke, named after people who make things smooth or polish things, possibly referring to the shell beads that a select group of skilled artists produced. Despite their intentions to subdue land held by savages, the English found themselves having to play by the rules of this place, just as the Indians did. Roanoke Indians and the English found that they had a lot in common. When an Indian emissary met the English ships commanded by Arthur Barlowe in July 1584, things went so well that Wingina, a werowance (principal leader) of Roanoke and other villages, decided to try to adopt the strangers. They both loved to trade, and they each offered items that they believed the other would value. The English offered ornamental things: metal serving dishes, mirrors, and beads. Indians gave the sailors food, hosted dinner parties, showed the English how to bathe properly, and volunteered protection against their enemies. After they landed, the commander of the 1585 expedition, Ralph Lane, began to believe that Wingina was going to betray the English’s weak colony to Indians farther west. Lane’s men ambushed and destroyed Manteo’s village of Croatoan, killing Wingina and impaling his head on a stake. Then, in the midst of a hurricane (probably something that he had never experienced), Lane fled the Carolina coast with the pirate Sir Francis Drake, who picked him up after pillaging Spanish settlements in Florida. Drake had captured several hundred Africans and Indians in his raids, and it is possible he left them on the Outer Banks when he picked up Lane’s men. One scholar calls these people the “first and almost entirely forgotten ‘Lost Colony.’”8 A few weeks later, another small group of soldiers landed as reinforcements; they did not get the message that Lane had fled in despair. Wanchese destroyed that group in short order, not only exercising political vengeance but enhancing his own montoac; he showed his allies and his enemies that he was more powerful than Wingina and could do what Wingina would not. 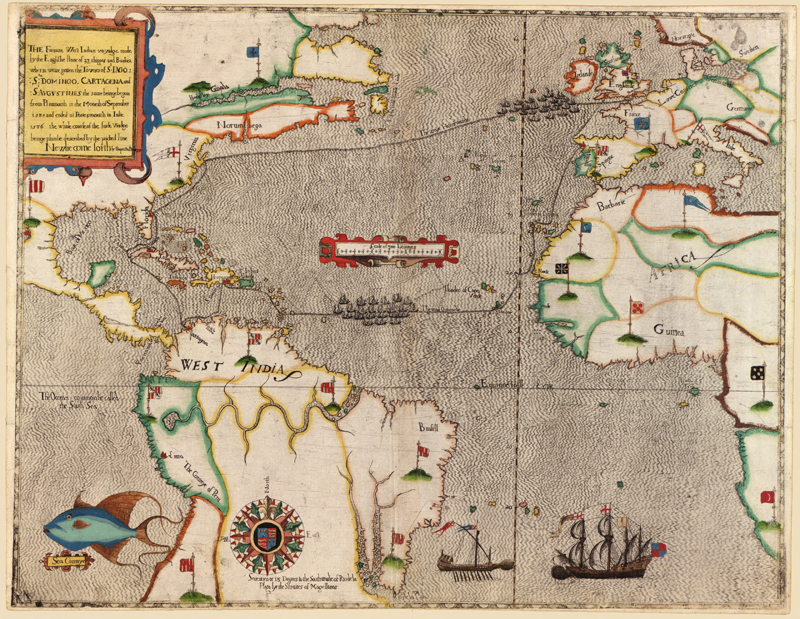 The commander of the 1585 expedition, Ralph Lane, fled the Carolina coast with the pirate Sir Francis Drake, who picked him up after pillaging Spanish settlements in Florida, part of Drake’s 1585-1586 transatlantic travels. Map from the Library of Congress. 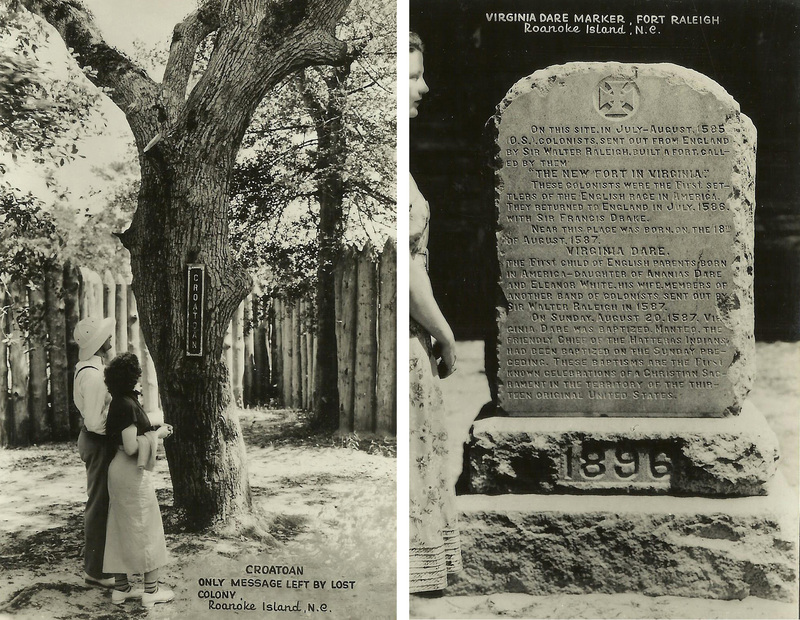 Left: Governor John White returned from England three years after Virginia Dare’s birth and found “Croatoan” carved on a tree, signaling that the settlers had taken refuge with White’s enemies — people he had brutally attacked. Photo courtesy of the State Archives of North Carolina. Right: The Virginia Dare Monument commemorates Dare’s birth and baptism in 1587. Photo courtesy of the Massengail Postcard Collection. The English could have negotiated permission instead of courting animosity, but the arrogance of Ralph Lane and the ignorance of John White precluded common sense. Innocent people suffered as a result, both English and Indian. Five days after Manteo’s baptism, John White’s daughter, Eleanor Dare, gave birth to a girl and gave her the English name for her new home, Virginia. Her parents could hardly have imagined worse circumstances for their little girl. Under the haze of cultural superiority, the leaders of this expedition had alienated the only people who could help the settlers survive. Undoubtedly frightened at the prospect of how the Indians would respond to the killings, the English families demanded that White return to England to get more supplies. White, it seemed, had permanently damaged any prospect of friendship with the Indians, except possibly Manteo. Hoping it would be a short trip, he agreed. The colonists did not disappear any more than Manteo’s Croatoan people had vanished. The man who recorded George Lowry’s history lesson on the steps of the Robeson County courthouse, Hamilton McMillan, believed that Indians from Croatoan adopted the desperate English settlers and that their descendants settled on Drowning Creek, later called the Lumber River. McMillan pointed to English surnames in the list of colonists (“Lowry” was not among them) and found parallel names among Robeson County Indians. While some of the surnames, such as Sampson, Brooks, and Berry, are unquestionable matches, most of the similar names are found as much in the English population as in the Lumbee population. The Lumbee story is about what it means to be indigenous and American. 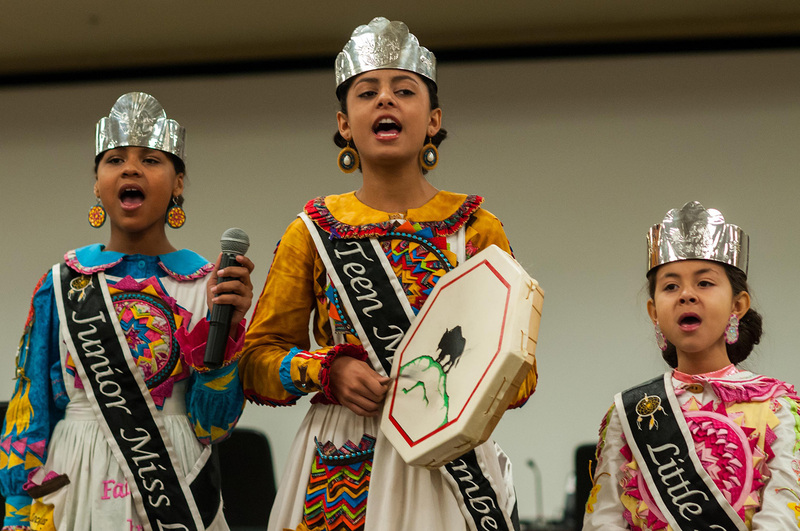 Here, three Lumbee girls sing at a U.S. Army event honoring the tribe for its contributions to the nation. Photo by Timothy L. Hale/U.S. Army. If the Hatteras Indians were not “pure- blooded” Indians, Lawson never discussed it, but such a category never would have occurred to him. At the time, the purpose of English colonization was to acquire Indian land; the mix of European with Indian culture was not significant to Lawson — the use and ownership of places was. 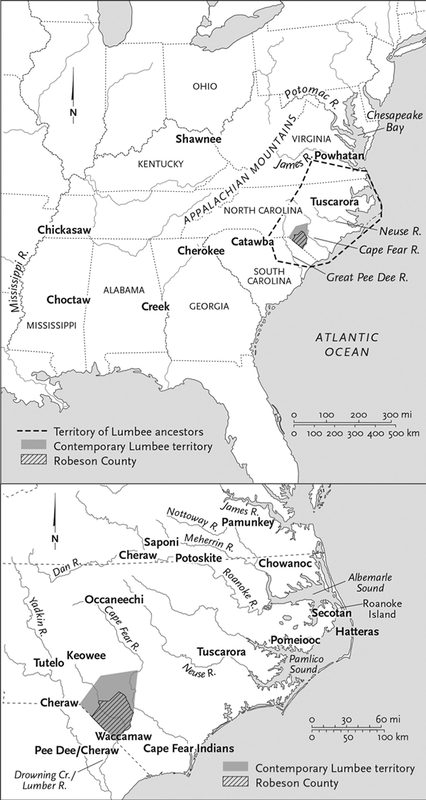 But there are many more plausible reasons for Lumbees’ similarity to Europeans other than their possible connection to the Lost Colony. First among them is that Indian people — like any others — change, borrow, and transform what they find useful, including languages, stories, food, materials, and religions. Far less is written in tribute to this process or to the Indians who continued to maintain power in that region for more than a century after these events unfolded. Of course, Indian people remembered, but their stories went largely unrecorded until Hamilton McMillan wrote down George Lowry’s eulogy for his murdered sons. Lowry, in his grief, glossed over the decisions that Indian people had made that led to English-Indian alliances. He emphasized how the Lumbees’ ancestors changed, borrowing English worldviews (through language and religion) that suited Indians’ determination to survive. But cultural change was a two-way process; both sides had to adapt. He knew he could not do justice to the whole story, not on that day when he wanted to expose the injustice of his people’s circumstances. For an interview with author Malinda Maynor Lowery, click here. 1 Hamilton McMillan, Sir Walter Raleigh’s Lost Colony: An Historical Sketch of the Attempts of Sir Walter Raleigh to Establish a Colony in Virginia, with the Traditions of an Indian Tribe in North Carolina. Indicating the Fate of the Colony of Englishmen Left on Roanoke Island in 1587, in O. M. McPherson, Report on Condition and Tribal Rights of the Indians of Robeson and Adjoining Counties of North Carolina, 63rd Cong., 3rd sess. (5 January 1915), S. Doc. 677, 50 (hereafter cited as McPherson Report). 3 Michael Oberg, The Head in Edward Nugent’s Hand: Roanoke’s Forgotten Indians (Philadelphia: University of Pennsylvania Press, 2008), 37; Colin G. Calloway, White People, Indians, and Highlanders: Tribal Peoples and Colonial Encounters in Scotland and America (New York: Oxford University Press, 2008), 34. 6 Coll Thrush, Indigenous London: Native Travelers at the Heart of Empire (New Haven, Conn.: Yale University Press, 2016), 35–36; Oberg, Head in Edward Nugent’s Hand, 59–64; see also David Beers Quinn, Set Fair for Roanoke: Voyages and Colonies, 1584–1606 (Chapel Hill: University of North Carolina Press, 1985), 39–40. 7 Oberg, Head in Edward Nugent’s Hand, 57. 10 Oberg, Head in Edward Nugent’s Hand, 112–13, 116–17. 14 Oberg, 123–26; for a summary of theories on the Lost Colony’s fate, see Helen Rountree, Pocahontas’s People: The Powhatan Indians of Virginia through Four Centuries (Norman: University of Oklahoma Press, 1990), 21–24. 16 Lawson, New Voyage to Carolina, 62. 19 Hamilton McMillan, Sir Walter Raleigh’s Lost Colony, in McPherson Report, 50.